- the silvery trumpets (and the Landrines’ timpenes). It can be observed that all and only these objects are defined as “magic”. It seems, therefore, that metal was known in the Dolomites in that period, but it was rare, reserved to greatly prized objects; moreover, the constant use of the word “magic” as a synonym of “metallic” probably denotes, more than the attribution of esoteric virtues to the objects as such, a meaning of the term “magic” alike to “created by art, not existing in nature”. This fact alone brings to date the origin of the legend well before the Roman Age. Most metallic objects that appear in the saga are, as expectable, weapons. We must first clarify the misunderstanding about the bows, Dolasilla’s and Spina-de-Mul’s, which are defined as “magic” and therefore “metallic” or “silvery”, while it is obvious that metallurgy at that time was lacking the know-how (both about alloys and the thermal treatments required to confer elasticity) needed to manufacture such an object, whichever metal might have been employed. 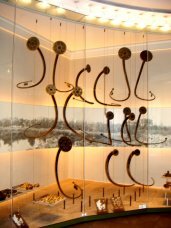 Not the bows, but the arrowheads actually were metallic: what anyway bestowed upon them a penetrating power quite superior to that of non-metalllic materials (stone, horn, hardened wood, maybe flintstone or quartz, provided that it was possible for the Fanes to get some). We also ventured to put forward the hypothesis that Dolasilla’s armour might consist of iron platelets: one of the first appearances of this metal, the properties and processing of which had still to be virtually unknown in the area. It is even doubtful whether it was possible to reach an oven temperature high enough to smelt iron completely, in order to get rid of impurities. Last, Ey-de-Net’s exceedingly heavy shield obviously ought to be a solid or layered bronze casting, while standard shields were made of wood (as they would be for many centuries to come), reinforced with bronze finishings at most. Casting an object like that was clearly out of range for any itinerant smelter, as it required a large workshop (in the Iliad we have a parallel in Achilles’ shield, for which Hephaestus himself is disturbed). More modestly, Ey-de-Net resorts to the “dwarf smiths” who lived at the lower end of the Fassa valley, more or less where we have today the hamlet of Forno (“Furnace”): an evocative name, even if we know nothing about the real existence of smelters there at that time. A last hint must be devoted to helms, a detail that is never missing in any portrait of warriors of that time, while the Fanes’ saga never mentions them. A single clue might be the “diadem”, where the Raietta was mounted, with which the Fanes’ king crowns his daughter on Plan de Corones. As Dolasilla will ever since enter the field wearing that object on her head, it is quite plausible that it really was a helm, probably a war trophy. As far as music instruments are concerned, we must stress that, for reasons connected with metallurgy, the “silvery” trumpets can only be made of bronze (the word “silver” in the saga presumably means any metal deprived of the yellow-reddish colour typical of copper, which is instead described as “gold”). Their presence denies that the legend may be dated earlier than the middle Bronze Age. They are certainly imported from abroad, a fact quite plausible in that period of documented long-range trading. It is also stated that the Fanes’ trumpets are quite superior to the Landrines’ timpenes under any aspect. Although there is absolutely no evidence of it, I like guessing that the silvery trumpets owned by the Fanes might be a pair of “lurs”, either original danish, or maybe manufactured in northern Germany imitating the danish ones. Trading between Baltic and Mediterranean during the Bronze Age is demonstrated by archaeological findings. The “lurs” were bronze trumpets shaped as tapered pipes and bent like mammoth’s tusks, sometimes over two meters long. Each trumpet of a pair was bent as a mirror copy of the other. They were manufactured in pieces that could easily be disassembled and reassembled, by an investment casting process that allowed walls down to 1 mm thick. Their sound has been reproduced, and it has been demostrated that they were tenor trombones capable of generating any note of the scale, with an amazing harmonic effect, specially when they were blown in pairs. In this review of metalworking in the saga, we cannot avoid mentioning the Vögl delle Velme. This character, depicted as an expert metallurgist who has travelled all over the world, outlines a Bronze Age itinerant smelter exactly, once more a category whose existence is well documented by archaeological evidences.